We are a day late but hope you had a happy Friday. As has been the trend, we are seeing a large focus on cryptocurrency assets and this update reflects that focus. Speaking on Cryptocurrency Hedge Funds – I will be in New York next week to speak Thursday at the Blockchain, Accounting, Audit & Tax Conference. The conference will have panels speaking throughout the day on various blockchain related issues. I will be part of a panel entitled “Digital Asset Management and New Financial Products” where we will discuss current and future investment vehicles as well as how investors are (and should be) viewing these products. More information on the event can be found here. California BitLicense – continuing the trend toward increased regulation of digital assets, California has proposed (for a second time) a regulatory regime for certain exchanges dealing with bitcoin and other “virtual currency”. This legislation comes on the heels of New York’s BitLicense requirement, along with other regulators beginning to look at blockchain based digital assets. As described below, we believe the SEC will be addressing the industry soon with questions and comments regarding certain aspects of the FinTech industry. For more on the California BitLicense requirement, please see here. Industry asks SEC to Publish Concept Release on Regulation of Digital Assets – a FINRA registered broker-dealer recently petitioned the SEC to provide guidance with respect to the regulation of digital assets (to be called Regulation DA). The broker-dealer asked that the SEC also consider adopting a regulatory sandbox for certain FinTech companies, similar to what is being employed in the UK and Singapore (the latter of which has seen a large influx of oversight/regulation of ICOs). The broker-dealer also mentioned that the regulation of digital assets should be consistent with crowdfunding regulations given that digital assets (ICOs specifically) share many characteristics in common with the crowdfunding industry. You can access the full petition here. Financial CHOICE Act of 2017 – on June 8, the House of Representatives passed the Financial CHOICE Act which is aimed at rolling back many of the changes implemented by the Dodd-Frank Act. There are a number of interesting things that this bill introduces, including: structural changes to the SEC, repeal of the Department of Labor’s (DOL’s) fiduciary rule, restructure the CFPB, and repeal the Volker Rule. All of the above would affect the investment management industry in profound ways but it is unlikely we will see any movement on this bill in the Senate any time soon. When and if we do, we will provide more analysis on the content of any legislation that is likely to pass and be implemented. An executive summary of the bill can be found here. The full text can be found here. This entry was posted in Cryptocurrency Issues, News and Commentary and tagged California BitLicense, CHOICE Act, DOL rule, Regulation DA on June 17, 2017 by nedaj. Happy Friday. Best wishes for a happy and safe Memorial Day weekend! Initial Coin Offerings – Bitcoin and other cryptocurrencies took center stage this weeks as new high prices were reached in volatile trading and euphoria around the Consensus Conference earlier this week. Initial coin offerings (or ICOs) were a major topic discussed and should be a major topic going forward. Artificial Intelligence Hedge Funds – perhaps lost over the last couple of weeks in the discussion of cryptocurrencies has been the general movement in finance toward utilizing artificial intelligence in the investment process. We recently wrote about artificial intelligence hedge fund strategies and detailed the issues that managers should consider when launching a fund in this space. For hedge fund managers, life does not change to a large extent (managers will likely need to update their subscription documents and may need to obtain additional representations from IRA and ERISA investors for any new investment made after June 9, 2017). SMA managers will need to be careful and should review their relationship with retirement investors. More information on this will be forthcoming on this blog and in our client updates. CFTC Focus on FinTech – the CFTC launched a LabCFTC Initiative which “aimed at promoting responsible FinTech innovation to improve the quality, resiliency, and competitiveness of the markets the CFTC oversees.” The overall goal of the program is to promote innovation for new FinTech products while providing the sponsors of such products more insight into the potential regulatory oversight of those products. Central to that goal will be GuidePoint which will act as “dedicated point of contact for FinTech innovators to engage with the CFTC, learn about the CFTC’s regulatory framework, and obtain feedback and information on the implementation of innovative technology ideas for the market.” This sort of proactive approach to innovation by regulators should be a welcome sight to new product sponsors. Cooperman Insider Trading Settlement – Leon Cooperman settled his insider trading case with the SEC, which released an interesting statement on the settlement. While the settlement allows Cooperman’s fund, Omega, to continue operating, Cooperman and Omega were subject to a $1.7M fine for insider trading. More importantly, the firm must retain an onsite independent consultant for the next 5 years to guard against insider trading. There were a couple of additional requirements of the settlement which, with the various fines and independent consultant requirement, have to make the SEC feel like they got a big win here. It will be interesting to see how or if this settlement is used as precedent in future cases. SEC Issues Cybersecurity Alert – on the heels of the WannaCry ransomeware attack, the SEC issued a Cybersecurity Alert. The alert is geared more towards smaller broker-dealers and investment advisory firms and provides background and links to other SEC resources on this issue. New York Employers Cannot Ask About Salary History – on May 4, New York Mayor de Blasio signed a bill making it illegal (and subject to fines) for an employer to ask questions about a candidate’s prior compensation. Hedge fund managers located in New York will want to discuss this issue with their internal HR persons, as well as their outside counsel. The bill is called “Intro. 1253” and goes into effect 180 days after the signing. A cached version of the de Blasio press release can be found here. This entry was posted in News and Commentary and tagged AI hedge fund, cybersecurity, DOL rule, ICO hedge fund on May 26, 2017 by nedaj. SEC New Chairman Jay Clayton Sworn In – last week Justice Anthony Kennedy swore in Jay Clayton as the new SEC Chairman. Clayton has a long background working in the the securities industry at a large law firm and has acted as a law school professor with respect to various aspects of the securities industry. Clayton begins the Chairmanship during rapidly changing times – technological innovation is changing both the products in the securities industry as well as how market participants interact with those products. We are both excited and hopeful that he will be able to lead the SEC in this this environment to adequately protect investors while also encouraging innovation and growth within the industry. More information on his background can be found in the SEC press release. State Cybersecurity Workshop – we hear about cybersecurity threats on an almost daily basis now; last week introduced a phishing scam involving Google Docs. As this issue continues to be a forefront issue, the regulators and states are trying to help industry participants become better prepared in this area. As an example, Washington state just announced that it will hold a “Cyber Security Workshop for Small & Medium Businesses” in Washington state in conjunction with the National Cyber Security Alliance (NCSA). We anticipate we will see more initiatives like this for investment managers going forward and encourage all managers to continue their education in this area. CFTC Reduces Burden for Swap CCOs – last week the CFTC published in the Federal Register amendments to regulations applicable to certain chief compliance officers of firms that engage in swaps. We recognize that these CCOs have a very difficult job (especially as the products become more and more complex) and we applaud the CFTC for attempting to identify areas where regulatory burdens can be lifted. We anticipate there will be a number of comments in this area, which are due by July 7, and we will provide updates as applicable. AI Trend Continues – we note that a number of the legal projects we are currently working on deal with Artificial Intelligence (AI) in some way. A service provider to the investment management industry, Orbital Insight, showcase that AI is front and center on the minds of the industry when it announced a $50M Series C round. State Carried Interest Tax Changes? – according to this update a number of states are contemplating changes to the manner in which carried interest is taxed. It seems like it will be a bit of a waiting game until a Federal tax bill is proposed, but it is interesting to note that there seems to be some kind of momentum toward changing the manner of taxation. CFTC Requests Public Input on Simplifying Rules – the CFTC announced that it is asking for input on how regulations should be modified to better address regulatory items and to reduce costs. We think this is a step in the right direction and also mirrors the initiative by FINRA (which we reported on earlier). We believe that investor protection is paramount, but we also believe that modifications to certain investment regulations can increase efficiency and reduce costs for market participants which would be a benefit for everyone. For more information see the CFTC’s ProjectKiss site; comments are generally due by September 30. This entry was posted in News and Commentary and tagged AI, cybersecurity, hedge fund carried interest, SEC Chairman on May 12, 2017 by nedaj. Happy last Friday of April. 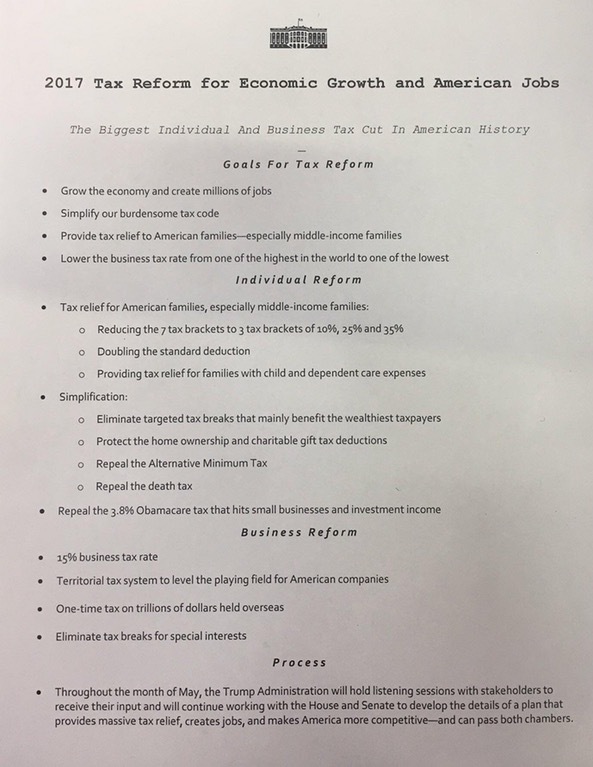 Trump Tax Plan & Financial Industry – while our quarterly update talked in part about potential future reform of the financial system, there is not really much to say yet about Trump’s one page tax plan. We do know, obviously, that the details will be forthcoming, but this plan leaves a lot of open questions and (surprise) remains silent on the carried interest issue. One item to note is that the tax plan proposes to repeal the 3.8% Obamacare tax – this is important because many fund managers have established structures to minimize the impact of this tax to the manager. As more information rolls out, we expect to hear from both accountants and tax planners about how any new tax plan would affect the private funds industry. Blockchain / Cryptocurrency / Altcoin Items – there continues to be an onslaught of items dealing with blockchain technology in the financial services sector, and we included some discussion of these items in our quarterly update linked above. On Wednesday of this week I attended EY’s Global Blockchain Summit in San Francisco (more on this coming soon). In addition, FINRA just announced a Blockchain Symposium which will be held in New York on July 13. According to the announcement, the “half-day program is designed to bring together regulators and industry leaders to discuss the use of blockchain and related opportunities and challenges.” It is important to note that blockchain appears to be an inevitable new structure/paradigm in business generally and investment management specifically – surprisingly, the regulators seem to be aware of this sea change and ready to work with the industry to implement appropriate regulatory structures to address investor protection concerns. Connecticut Hedge Fund Tax – there have been a few news articles about a potential tax on private fund managers in Connecticut. I have not kept up on this issue in depth, but it should be interesting to see how this plays out and whether any other states will follow suit. FINRA Insider Trading Information – FINRA has begun to take an active role in finding and dealing with insider trading. Just recently they released an interesting video with Cam Funkhouser, Executive Vice President of FINRA’s Office of Fraud Detection and Market Intelligence (OFDMI), about insider trading and some “red flags” to look out for. FINRA Bootcamps – FINRA announced three compliance boot camps for may – Dallas (May 11), Memphis (May 17) and Charolette (May 31). This entry was posted in News and Commentary and tagged Bitcoin hedge fund, Quarterly Update on April 28, 2017 by nedaj. Below is our quarterly update which went out via email today to our firm’s clients and friends. Links coming soon. We hope that you are enjoying an auspicious start to 2017. The first quarter of the year is typically one of the busiest for fund managers from a regulatory standpoint. As a variety of filing deadlines have passed and audit work is completed (or will be soon), we enter the second quarter with a number of important regulatory issues on the horizon, as well as many other topics worthy of discussion. Below, we have prepared a short overview of some of these items. Trump Executive Order Could Reform Dodd-Frank. President Trump issued an executive order on February 3, 2017, setting out seven “Core Principles” which will serve as general guidelines for financial regulatory reform. The Core Principles include making regulation more efficient, effective and appropriately tailored, as well as rationalizing the Federal financial regulatory framework. The order appears implicitly targeted at reforming the Dodd-Frank Wall Street Reform and Consumer Protection Act (“Dodd-Frank”) and decreasing many of the current financial regulations, but we note that any changes to the current regulatory landscape may not be as immediate as many initial reactions assumed. According to the order, the Treasury Secretary is to meet with the various agencies that oversee and implement Dodd-Frank (including the SEC), to discuss areas that may be amended. While a repeal of Dodd-Frank is unlikely, the coming months may bring a number of deregulatory changes. We will be following any resulting changes and will discuss significant impacts of such changes in future quarterly updates. Department of Labor Delays Fiduciary Rule. On April 7, 2017, in response to a presidential memo from President Trump, the Department of Labor (“DOL”) issued a Final Rule delaying the applicability of the “Fiduciary Rule” until June 9, 2017, although full compliance with the Fiduciary Rule is still expected by January 1, 2018. We had previously discussed the Fiduciary Rule, which expanded the scope of who is considered a “fiduciary”, imposing fiduciary obligations on firms which were historically free from such obligations. While the DOL will use the delay to reexamine the Fiduciary Rule and consider modifications to it, if you have not already done so, we recommend that you review and speak with your counsel about whether you would be considered a fiduciary and what additional obligations and implementation processes will need to be incorporated into your business practices. CFTC Regulation of Bitcoin and Virtual Currencies. There has been an increasing interest in investments in Bitcoin and other cryptocurrencies as the financial and technological landscape evolves, but determining the regulations applicable to such products is less clear. While the CFTC established that Bitcoin and other virtual currencies are “commodities” within the definition of the Commodity Exchange Act of 1936, as amended (“CEA”), under the CEA, only commodity interests (which include futures, options, derivatives and certain spot transactions) based on the commodity are within the scope of the CFTC’s jurisdiction. Recent enforcement actions brought by the CFTC have helped clarify whether a transaction is subject to CFTC regulation. In an Order issued against the Coinflip, Inc. platform (“Coinflip”), the CFTC imposed sanctions against Coinflip for operating a facility for trading Bitcoin derivatives without being registered as a futures exchange or swap execution facility. In a contrasting enforcement action brought against the Bitfinex platform (“Bitfinex”), which did not list or permit the trading of derivatives, the CFTC asserted its jurisdiction over Bitfinex on the basis that the platform dealt in “retail commodity transactions”— leveraged, margined or financed transactions involving a commodity that are offered to persons that are not “eligible contract participants” — without being registered as a futures commission merchant with the CFTC. Certain retail commodity transactions are exempt from CFTC jurisdiction if the seller “actually delivers” the commodity to the buyer within 28 days of the date the contract was entered into; the CFTC deemed that Bitfinex did not “actually deliver” the cryptocurrencies to buyers because among other reasons, Bitfinex held the private key controlling access to the wallet where the buyers’ cryptocurrencies were held. Managers investing in Bitcoin or other virtual currencies should consider whether and to what extent the types of transactions may subject them to CFTC jurisdiction and potential registration as a CPO or CTA. In the current regulatory landscape, we believe managers who invest purely in virtual currencies and who do not employ virtual currency derivatives or leverage are outside the scope of the CFTC’s jurisdiction, and should not be required to register as a CPO or CTA. Although further regulation is expected, firms should speak with outside counsel to confirm their status in light of the current regulatory framework. Other Regulation of Bitcoin and Virtual Currencies. While the CFTC has been the most active regulatory authority to address investments in cryptocurrencies, managers should be cognizant that states (including New York), the SEC, FINRA and FinCEN are also deliberating the question of appropriate regulatory oversight. We will continue to monitor regulatory developments and more information about certain regulatory aspects applicable to private funds can be found in our blog post on Bitcoin / Cryptocurrency Hedge Funds. NFA Provides Guidance on Amended CPO Financial Report Requirements. In our previous 2016 End of Year Update we discussed the CFTC’s amendments providing relief from certain financial report requirements for commodity pool operators (“CPOs”), which became effective on December 27, 2016. The NFA released a Notice setting forth instructions regarding how CPOs can file the appropriate notices with the NFA to claim any of the relief provided for in the amendments. CPOs who are eligible for the amended regulations should contact counsel or compliance consultants, or review the Notice, to determine whether any further action may be warranted to claim the appropriate relief. U.S. and Global Regulators Relax March 1st Deadline for Swap Variation Margin Compliance. The Federal Reserve and the International Organization of the Securities Commission have provided some flexibility for swap dealers facing a March 1, 2017, deadline to implement certain variation margin compliance requirements for uncleared swaps. The rules require swap dealers to collect and post variation margin with no credit threshold unless an exception applies. Further, covered counterparties would be required to enter into new or amended credit support documentation, limit the types of collateral that may be posted and prescribe minimum transfer amounts. Compliance with the requirements can be challenging for swap entities and their counterparties as they work to implement the necessary documentation and underlying operational processes. Except for transactions with financial end users that present “significant exposures,” the Federal Reserve’s guidance directs examiners of CFTC-registered swap dealers to focus on the dealer’s good faith efforts to comply as soon as possible but by no later than September 1, 2017. BEA Makes Changes to Direct Investment Survey Reporting Requirements for Certain Private Funds. The Bureau of Economic Analysis’ (“BEA”) changes to its direct investment surveys went into effect on January 1, 2017. The reporting changes apply to investments by U.S. entities of a 10% or more voting interest in a private fund, and to investments by foreign entities of a 10% or more voting interest in a U.S. domiciled fund. Under these changes, any cross-border voting investments of 10% or more in, or by, private funds will be subject to BEA reporting only if such investments involve, directly or indirectly, a direct investment in an “operating company” that is not another private fund or a holding company. The changes will simplify reporting for private funds because certain direct investments in private funds will be re-characterized as portfolio investments depending on the nature of the private fund’s investments. Many hedge funds that were traditionally subject to BEA direct investment reporting because of cross-border voting interests will instead only be required to report on portfolio investments to the Treasury Department on Treasury International Capital (“TIC”) surveys. The BEA will notify any filers that may be potentially affected by these changes, but we recommend that advisers consult with counsel to determine what, if any, BEA and/or TIC reporting obligations they may have. Treasury Department Proposes New Anti-Money Laundering Rules for Investment Advisers. The Treasury Department’s Financial Crimes Enforcement Network previously proposed extending the requirements of maintaining a formal anti-money-laundering (“AML”) program under the Bank Secrecy Act of 1970 to SEC-registered investment advisers (“RIAs”). The final rule is expected to be published soon, and would require SEC RIAs to establish a robust AML program with policies and procedures to identify questionable activity, periodic testing of the program and ongoing training of appropriate personnel. California’s Public Investment Fund Disclosure Requirements Now Effective. In our third quarter update, we reported that California passed a bill requiring increased disclosure by private fund managers for funds with investments by California state and local public pension and retirement systems. The legislation went into effect on January 1, 2017. All public pension and retirement systems in California must require hedge funds, private equity funds, venture capital funds and any other alternative investment vehicles in which they invest to disclose certain information regarding the fund’s fees, expenses and performance. In addition to applying to new contracts entered into on or after January 1, 2017, and pre-existing contracts with new capital commitments made on or after January 1, 2017, the legislation requires that public pension and retirement systems make “reasonable” efforts to obtain the increased disclosure information for contracts entered into prior to January 1, 2017. Fund managers with California public plan investors should review the types of information that will need to be provided to such investors and prepare to provide the required information. SEC No-Action Letter and Guidance Clarify Inadvertent Custody. On February 21, 2017, the SEC issued a no-action letter responding to a request for clarification from the Investment Advisers Association as to whether an investment adviser has custody of a client’s assets if the adviser acts pursuant to a standing letter of instruction or other similar arrangement established between the client and its custodian (“SLOA”), that grants the adviser limited authority to direct transfers of the client’s funds to one or more third parties. The SEC’s position is that an SLOA that authorizes the adviser to determine the amount and timing of payments, but not the payee’s identity, is sufficient authority to result in the adviser having custody of the assets. However, the SEC agreed that it would not recommend an enforcement action against an adviser that does not obtain a surprise examination, if the adviser acts pursuant to an SLOA under certain specific circumstances set forth in the SEC’s letter. The SEC also reaffirmed that advisers will not be deemed to have custody of client assets if the adviser is given limited authority to transfer client assets between the client’s accounts maintained at one or more custodians. To further clarify its views on inadvertent custody, the SEC also issued a guidance update highlighting certain circumstances where an investment adviser may inadvertently have custody of client funds or securities. An adviser may have custody because of the wording or rights of custodial and advisory agreements, even if the adviser did not intend to have custody and was not aware it was granted the authority that resulted in its having custody. We urge advisers to separately managed accounts to review their client agreements and any SLOAs they have entered into to determine whether their specific arrangements may cause them to have custody, and to evaluate their policies and practices related to custody of client assets. SEC Published Examination Priorities for 2017. The SEC announced its Examination Priorities for 2017, which focus on themes of examining matters of importance to retail investors, focusing on risks specific to elderly and retiring investors and assessing market-wide risks. Specifically, the SEC will focus on: (i) identifying initiatives designed to assess risk in the context of retail investors, including never-examined investment advisers and exchange-traded funds, and notably, robo-advisers and other automated, electronic investment advice platforms, including the investment advisers and broker-dealers that offer them; (ii) services provided to retirement accounts, such as variable insurance products and fixed-income cross-transactions, as well as investment advisers to pension plans and other large holders of U.S. investor retirement assets; and (iii) cybersecurity, and systems and technology procedures and controls. FINRA Published Examination Priorities for 2017. Similar to the SEC, the Financial Industry Regulatory Authority, Inc. (“FINRA”) recently published its 2017 Regulatory and Examination Priorities Letter, outlining the organization’s enforcement priorities for the current year. FINRA’s specific focus areas for 2017 will include: (i) supervisory policies and compliance controls for high-risk and recidivist brokers; (ii) sales practices and product suitability for specific investors; (iii) firm liquidity management practices; and (iv) cybersecurity issues. We recommend that you speak with your firm’s outside counsel and service providers to learn more about these specific priorities and review your firm’s compliance with the applicable regulations. Cayman Islands Extends CRS First Notification and Reporting Deadlines. The Cayman Islands Department for International Tax Cooperation (“DITC”) has issued an industry advisory stating that it is adopting a “soft opening” to the notification and return deadlines required for Financial Institutions’ (“FIs”) compliance with the Common Reporting Standard (“CRS”). All FIs in the Cayman Islands are required to register with the Cayman Islands Tax Information Authority (“TIA”) by April 30, 2017, and to submit returns to the TIA by May 31, 2017. With the DTIC’s adoption of a “soft opening,” FIs may submit CRS notifications on or before June 30, 2017, and file “accepted” CRS returns on or before July 31, 2017, without any compliance measures or penalties. Ninth Circuit Rules Internal Reports Protected under Whistleblower Rules. On March 8, 2017, the Ninth Circuit followed a ruling by the Second Circuit in finding that an employee who makes a report internally, rather than to the SEC, is protected under Rule 21F-17 of the Securities Exchange Act of 1934, as amended (“Whistleblower Rule”) enacted under Dodd-Frank. In contrast, the Fifth Circuit previously ruled that the provisions of the Whistleblower Rule only apply when an employee makes disclosures directly to the SEC. The Ninth Circuit and Second Circuit rulings reflect a broad interpretation of the definition of a whistleblower, and signal a split among the circuit courts on who may be considered a whistleblower for purposes of protection under the Whistleblower Rule. Regulatory Assets Under Management. We have observed that many managers have expressed confusion regarding the calculation of assets under management (“AUM”) for purposes of filing the Form ADV and determining when the manager may be subject to SEC registration. We thought it would be helpful to clarify that investment advisers must look to their “regulatory assets under management” (“RAUM”), a specific metric designed by the SEC, which is calculated differently from the more common and more traditionally understood calculation of AUM. In calculating RAUM, managers should include the value of all assets managed without deducting for any offsetting liabilities. Managers with questions about the calculation of specific assets or managers seeking further clarification of RAUM should speak with their firm’s outside counsel or compliance consultants. This entry was posted in News and Commentary and tagged Bitcoin hedge fund, Quarterly Update on April 27, 2017 by nedaj. Happy Friday. Markets are closed today for the holiday and it is tax day this Tuesday. Enjoy the weekend! SEC Brings Actions Against Authors on Investment Article Platforms – platforms like Seeking Alpha and SumZero have been popular places for investment managers to post articles about their investment ideas. Managers post for a number of reasons including to hone their own investment thesis, hear counterarguments and to generally be part of a community actively involved in the discussion of ideas. We routinely work with managers who are posting articles on these platforms and help them think about the compliance obligations they have with respect to any postings. The SEC just announced a major series of enforcement actions against 27 individuals for posting fake and fraudulent articles on these platforms. Settlements have already ranged from $2,200 to almost $3 million. While the standard hedge fund manager we deal with is unlikely to be involved in the creation of fake or fraudulent articles (or using these platforms to manipulate positions), these enforcement actions show that the SEC is actively looking at information posted on the internet as a way to find persons involved in securities violations. Most registered managers will already have social media policies in place that should deal with situations like this, including how to document the posting, but we also recommend that managers discuss articles with their attorneys or compliance personnel before posting. We believe that (to the extent it has not already happened) the SEC will be closely scrutinizing internet postings during routine manager examinations and that managers need to make sure any such actions are not manipulating the markets (in addition to making sure there is no appearance of manipulation). FINRA 360 Announced – FINRA just announced a new initiative to “evaluate various aspects of its operations and programs to identify opportunities to more effectively further its mission.” The initiative is was announced as FINRA 360 in Regulatory Notice 17-14 and focuses on the following, in addition to other FINRA rules: CAB Rules, Funding Portal Rules, Numerous FINRA rules and the Trading Activity Fee. The goal of FINRA 360 is to ”increase efficiency and reduce unnecessary burdens on the capital-raising process without compromising important protections for issuers and investors” which we think is a step in the right direction. However, we have previously discussed two FINRA initiatives (here re CABs and here re scrapping the 7) as perhaps a bit misguided. In any event, we think FINRA is taking a great step here and we also believe that this provides an opportunity for the industry to provide FINRA with meaningful feedback and ideas. All are encouraged to comment and comments are due by May 30, 2017. Greyline Solutions Expands Compliance Offering to Broker-Dealers – the regulatory compliance consulting company Greyline Solutions (editors note: I am a minority owner in this business) announced the upcoming acquisition of Vista Compliance which will add significant broker-dealer expertise to its RIA offerings. For more information, please see the press release. This entry was posted in News and Commentary and tagged FINRA 360, seeking alpha, sum zero on April 14, 2017 by nedaj.